The Ultra-safe Break-Away from Brite Inc. is most often thought for use in psychiatric facilities, rehabilitation centers and correctional facilities, but our curtains can also be found on boats and in RV�s. Even the US Navy uses our Ultra-safe Break Away curtains. The Ultra-safe Break-Away curtain is available as a cubicle and privacy curtain, as a shower curtain and as a window curtain. Two track systems are available, a wall mounting track and a ceiling/ soffit mounting track. Each track comes complete with 3 tabs per foot length of track. The tabs slide into the track through an inconspicuous opening and quickly and easily attach to the continuous loop tape that is securely sewn into the top hem of the curtain. All tracks come with non-removable end-stops. 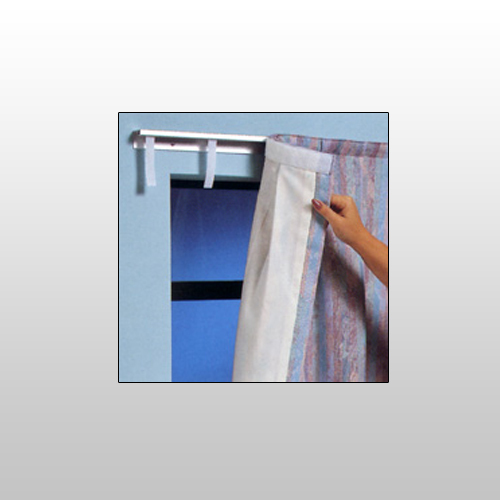 Additional tabs can be ordered and spaced closer together to handle heavier weight curtains. If you have any questions regarding our Ultra-safe Break-Away curtains please call and speak with one of our friendly and helpful customer service team members. Toll Free 800-791-2946.